All of this for less than Php 400.00! Not bad at all. 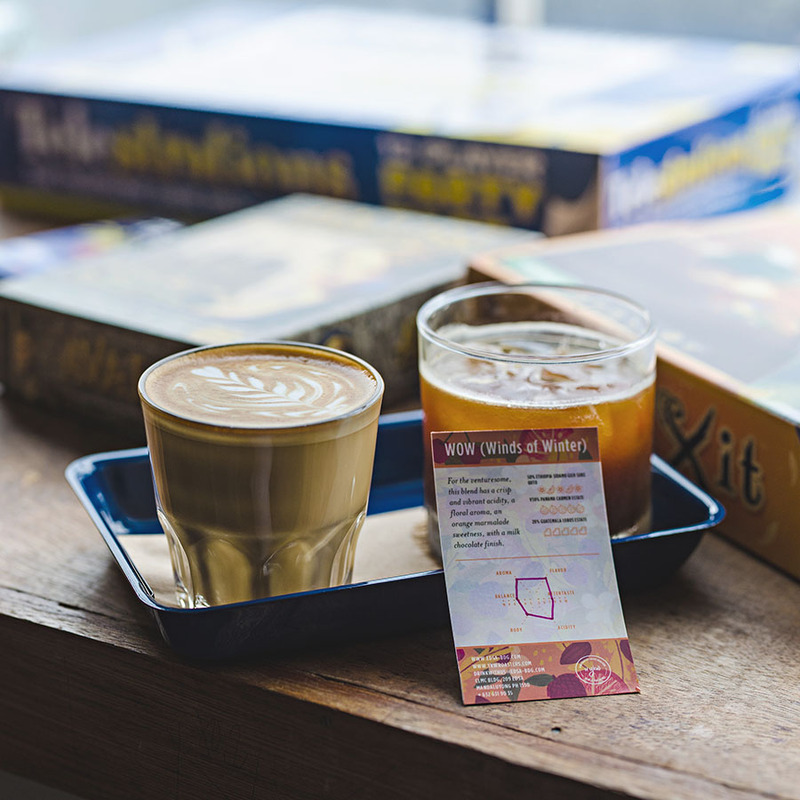 Yesterday, I met up with some officemates over at EDSA Beverage Design Studio (a place that, if you follow any of my social media accounts, you would know I frequent) for some boardgame fun over coffee. The rare occasion that I get myself a latte. Behind the scenes of the latte art. Their signature Winds of Winter blend in latte and iced americano form. Good stuff either way. We had a couple of cups over the afternoon ranging from locally sourced beans from Mt. Apo to their signature blends, mainly their Winds of Winter blend. We spent a good four hours in the cafe before the hunger pangs started kicking in. This, naturally, got us thinking: Where to for dinner? The first place that came to mind, which I’ve been meaning to visit recently, was Eat Fresh Hong Kong Street Food over at J. Abad Santos, just off of Wilson St. This little shop has always been high up in the list places I consider whenever I find myself in the Wilson/P. Guevara area ever since I first tried it around a year back. The unassuming exterior of the restaurant definitely makes it stand out compared to it’s more commercial looking neighbors. 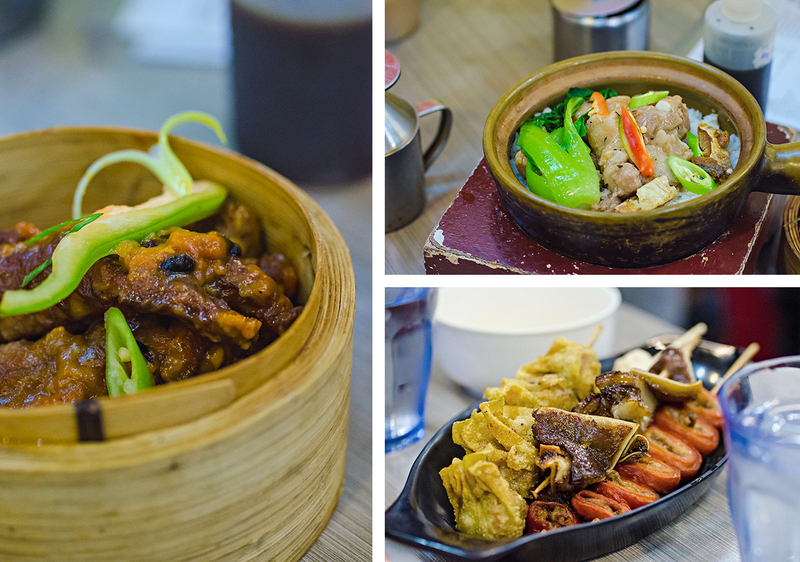 The no-frills look and feel of the place really lends well to it’s charm, giving it the ambience that you would expect from a hole-in-the-wall eateries in Hong Kong. A quick snap of the Eat Fresh menu with all their mains. 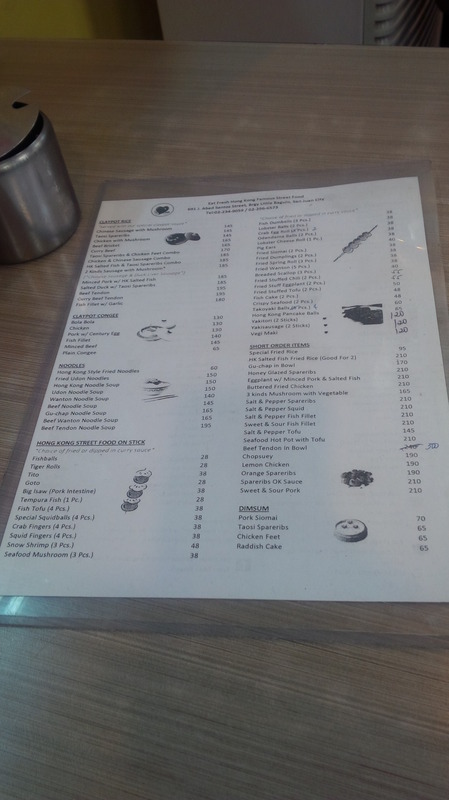 The second page of the menu is mostly for their drinks and their desserts. My usual orders would always be their chicken feet, fried big isaw (pork intestines), and fried pig’s ears. 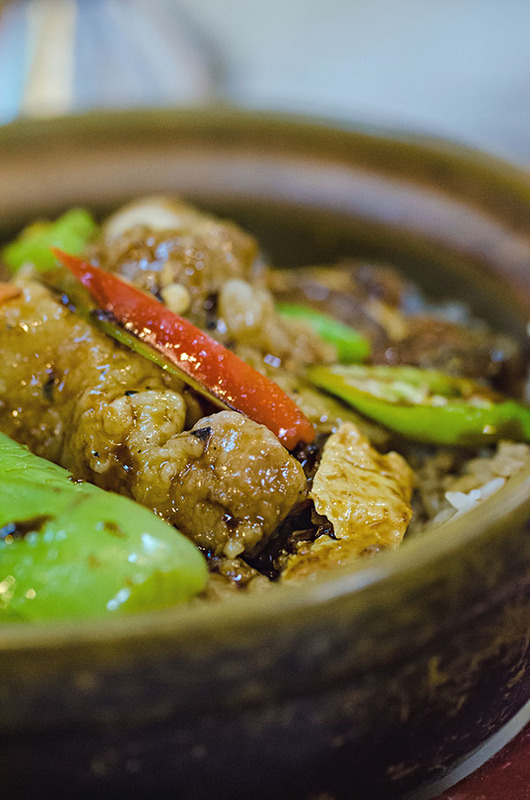 For my main dish, I got myself a claypot rice with Hong Kong salted fish and black bean spareribs. Their version of chicken feet doesn’t have as much sauce as your usual order from other restaurants. The feet themselves were nicely cooked with the skin just falling of off the bones and the cartilage being soft with still a nice bite to it. The meal was off to a pretty good start already! Why order these? Meat on a stick. That’s why. 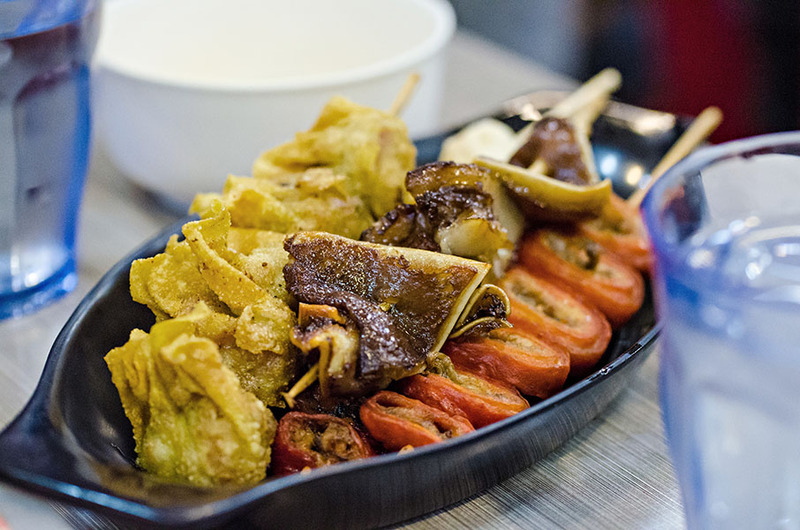 Their Hong Kong street food on sticks can be ordered either fried or in a curry sauce. For most of my orders, fried seemed like the way to go although for their other items like the fish balls would probably go well with the curry sauce. Their version of isaw is marinated in a way that the taste of these little crispy, fat-laden rings really reminded me of char siew. They were just the right amount of sweet and had a really good meaty flavor. My only comment on these was that the bigger pieces tended to be a bit on the chewy side and were hard to swallow even after a few minutes of intense chewing. The smaller bits were just perfect though so those were great. These would probably be what sisig would be like if it weren’t all chopped up finely. I’ve always loved the texture of pig’s ears which are part gelatinous and part crunchy thanks to that little layer of cartilage in the middle of each piece. 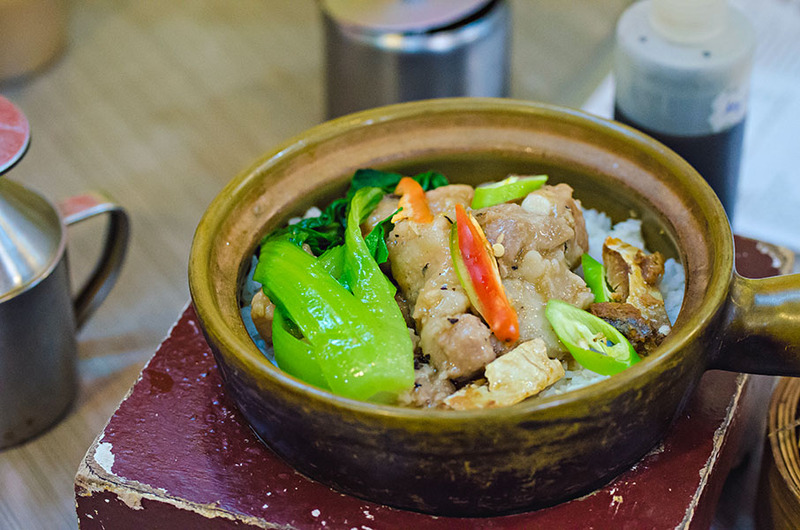 They offer different versions of the claypot rice too. This was a departure from my usual noodle soup whenever I’m in a Chinese restaurant. The claypot was not super hot like what I had expected to get upon ordering. This meant that the rice did not really crust up to give that little bit of textural contrast from the generally soft toppings that came with my order. 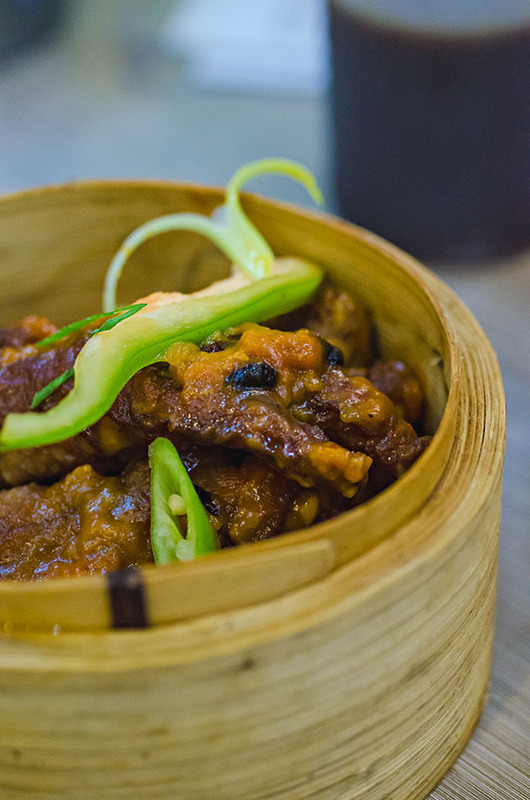 The spareribs are what you would expect from your usual dimsum cart and were good but not something I would call spectacular. What did stand out for the dish for me though was the salted fish which was soft and flaky, something that came as a surprise for me as I was expecting little pieces of dried, salted fish. My claypot rice all sauced up. The claypot rice also came with a little metal pot that carried their special claypot rice sauce. The sauce was very light and helped provide a little caramelization for the rice that stays in contact with the claypot. This was pretty good and really helped round out the seasoning of the dish quite nicely. The food here was pretty good for the price. The place really is perfect if you want to have a quick, delicious, and cheap meal. Their service is quick and their staff, attentive. A word of caution though: Do come in early if you plan to eat there with a big group as the place seems to fill up quite nicely. If there are only 2-4 of you eating then your wait time should be quite quick.